They wanted to be perfect. But who said that being perfect meant being good? Musically talented Mackenzie Wright plays the cello and is applying to Juillard, while flirting with her best friend’s boyfriend. Sporty Caitlin Martell-Lewis is one goal away from a prestigious soccer scholarship, but can’t figure out who she likes more; her boyfriend Josh or his brother. Julie Redding, the most popular girl at BHHS, has a huge secret that could make her a loser forever, if discovered. Beautiful Ava Jalali is in an extremely awkward situation, with her Film Studies teacher Mr. Granger, one that could lower all of her good grades. Shady Parker Duvall used to be the “It” girl of BHHS, but abuse from her father has torn her life as well as her mother’s relationship with her, to pieces. But Mackenzie, Caitlin, Julie, Ava and Parker all have one thing in common; they all hate Nolan Hotchkiss. The boy who’d come into their lives,and shattered them forever. Nolan was the richest, most popular boy in Beacon Heights, Washington. He was known and hated throughout the school for causing pain to others. Yet nobody had the courage to stand up to him. Until now. When the five girls all discovered that they have a common hatred for Nolan, during a group discussion in Film Studies class, they started to plan his murder for fun. The details all started to come to them. Parker suggested using Cyanide and Oxy, Nolan’s drug of choice. Ava decided on the perfect day for the homicide, the day of Nolan’s annual party. Every last detail was thought of. But they were just doing it for fun. They never intended to go through with their nefarious plan. Then something went wrong. Nolan Hotchkiss, was found dead on a couch, killed with Cyanide, on the night of a party that he hosted in his cavernous mansion. But Mackenzie, Caitlin, Julie, Ava and Parker had nothing to do with it. Each of them are now struggling to prove themselves innocent when thought to be guilty. Can they clear their names in time to save their futures? Or will they end up in prison? 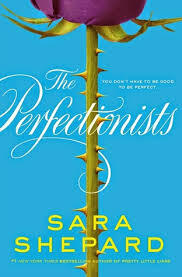 In The Perfectionists, Sara Shepard has written yet another astounding book that I couldn’t stop reading until the final page. Shepard’s writing appeals to many audiences because her books are about people that seem perfect on the outside, but are completely different on the inside. This makes the characters comparable and relatable to the reader. Shepards’s books are all roads that have many twists and turns. But even though the ride is bumpy, you just want to keep driving along it. I can guarantee you that as soon as the sequel, Good Girls hits the bookstores, I will be the first one at the door of Barnes & Noble. If you liked the Pretty Little Liars series, or The Naturals series, you will adore this book. What I especially enjoyed in The Perfectionists is the way that it challenges your brain to ask questions. “Who killed Nolan?”, “Why did Ben, Claire’s boyfriend, deceive Mackenzie like that?”, Why is this happening?” So far, all of Sara Shepard’s books made me contemplate their mysteries . Then, when I thought I knew what would happen, everything changed. In conclusion, I really enjoyed this book, and I would recommend it to others. However, the story would probably appeal most to a teenage female audience.